Believe it or not, dear readers, I actually didn’t show you ALL the photos I took during my recent antique store visits (in which I went up and down every aisle to the disgust of seven-year-old me). Which means, yes. 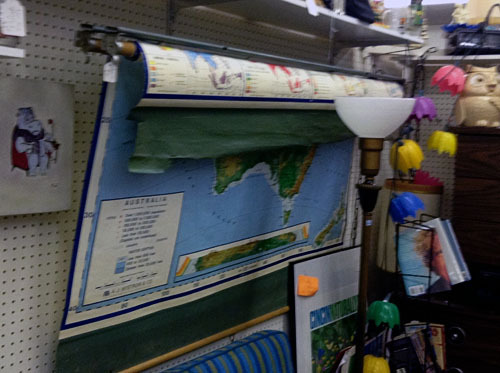 I am the crazy lady with the new shiny touch-screen doodad taking photos in the junk store. What of it? You see, I had to take so many photos because there were so many trendy things in the antique stores. 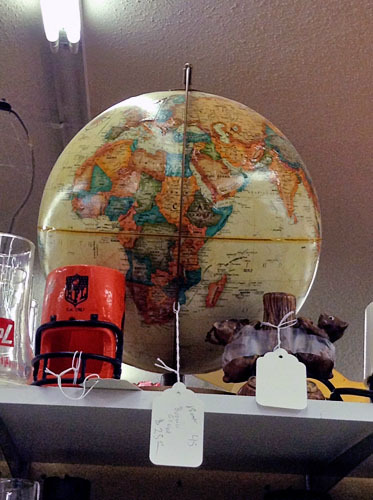 These are junk stores with smart sellers that are reading our favorite home décor blogs. I mean, they have to be. How else would they know that we project-lovers are going bonkers over old windows and globes? 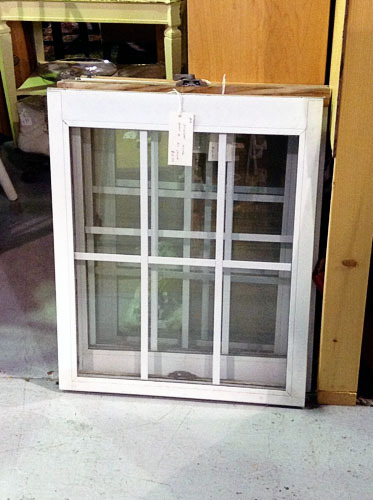 That first photo shows a selection of aluminum windows up for grabs. 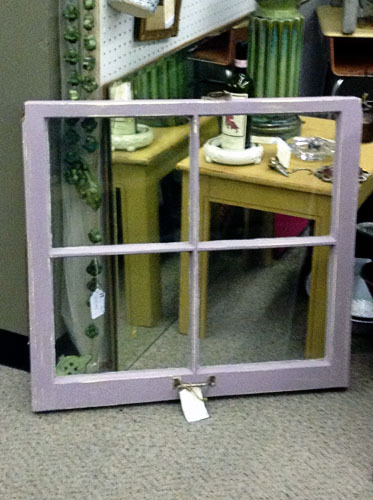 Aluminum windows are not really every crafter’s dream, but at $10 a piece (negotiable, of course), I could easily see the project potential. The two other photos are from one (of several!) other booths selling real wooden windows. And as an extra trendy bonus, the seller stenciled numbers on it. Voila, a pre-made project! You just have to pay thirty-something dollars for it. There were so many other windows for sale at these stores, but I was already that lady loitering in the store pretending to text (hahaha I don’t text) while taking photos, so you’ll just have to imagine. 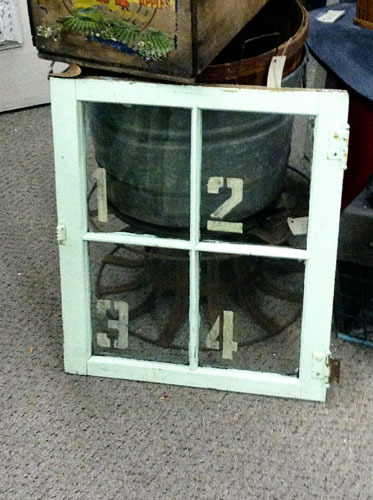 Window crafts: so trendy, even the thrift store people know you want them! 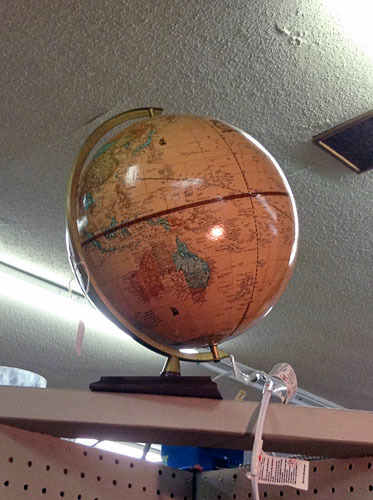 Along the same line: globes. Dude. 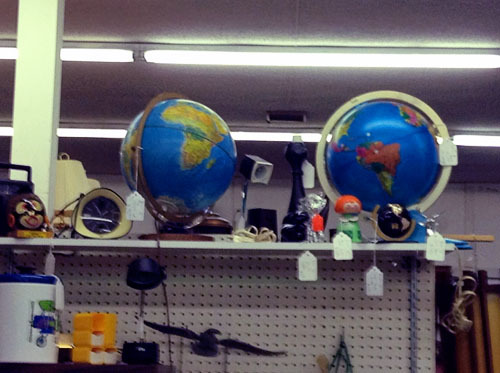 So many globes. All were priced under thirty bucks, which didn’t strike me as particularly gouge-worthy considering how hot they are in design right now. And most had the USSR on them, which gives you an idea of their age and gives me flashbacks to elementary school geography lessons. Also popular nowadays? Maps. 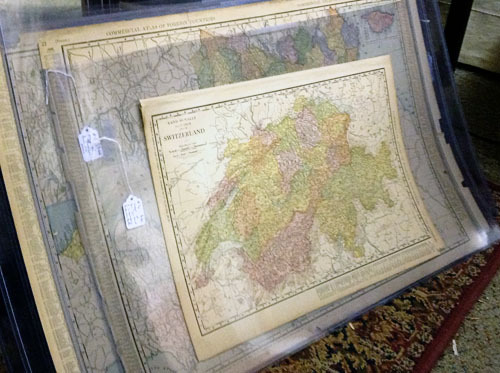 Even fake century-old maps. Okay, I don’t know exactly how old this is, but if it were a real antique, I’m sure it would be going for more than $20. The frame could sell for $20, seriously. There was a definitely schoolhouse-ish theme going on with lots of the maps I saw. If only there was a way I could get a pull-down map of someplace meaningful to us! And if only I could convince Mr. P of its cool factor! 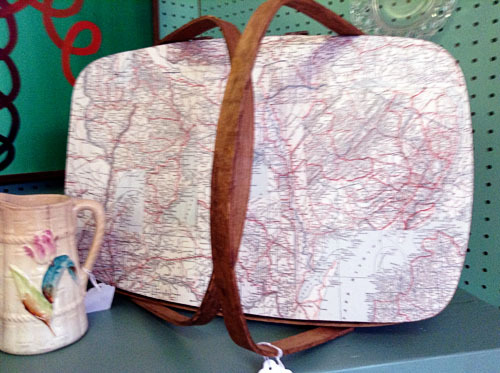 Or this map-decoupaged picnic basket because.... I don’t even know. I mean. That is... just no. I wanted Italy (as a honeymoon memory), but alas, there wasn’t one. I put Switzerland in front just for the photo, in honor of the Swiss Mister. 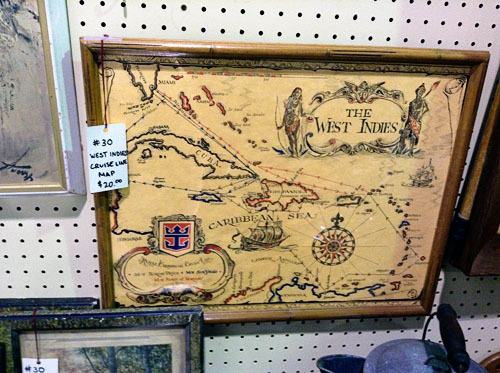 And in any case, these true antiques were pulling $50 and up apiece – unframed – so if I had found Italy, I’d have had a serious soul-searching moment deciding whether to buy it. Instead I had a very long deliberation over this map. 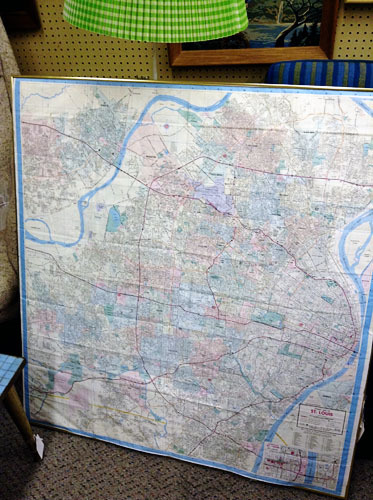 Of all the many things I saw that day, this was the thing I came closest to buying: a huge (I’m guessing around three feet by three feet square) street map of St. Louis metro area. It was probably grabbed from some AAA office and stuck in a seat-pocket for thirty years before it was placed in this buckling frame, which is why $20 seemed a little steep. But oh. I fawned. I carried it around. I crouched on the floor and traced along routes with my finger. But alas, I walked away... at least for today. Who knows, maybe the next time I’m trendspotting in the junk shops, it’ll still be there for me to buy. 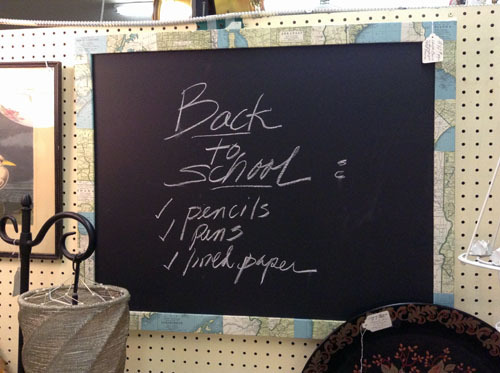 In the meantime: are you pleased that the junk stores are pushing the popular goods nowadays? Or does it creep you out the tiniest bit? I admit I fall into both camps.